Two wavy red-haired mavens of the news world– the resemblance can not go without mention. 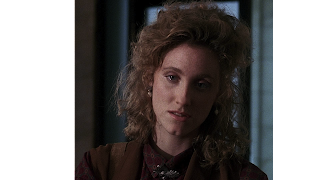 To the left is April O'Neil, the resilient NYC reporter of the early 90's cult classic, Teenage Mutant Ninja Turtles. (Yes. Cult. Classic.) 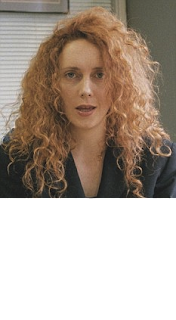 To the right, Rebekah Brooks– dubious lady and focal point of the recent British press phone-hacking debacle. Both women with their own threads of fictitious. With the tight-lipped and seemingly stylized performance of Tuesday's Parliament hearing, I'd say Ms. Moore could borrow from April O'Neil beyond the locks and faded freckles. Sure, April is a cable television reporter and not the all-mighty overseer, but ethics and democracy are her baseline. She single-handedly befriended the Ninja Turtles (exclusive) and helped break NYC's biggest crime crunch of the moment. On her own watch, she goes out of her way for justice. To Rebekah Brooks– may life imitate art. Or something. There is a look-a-like happening. And just for another kick..... a message.